The Knapp Center STEPS program utilizes the evidenced based practice of applied behavior analysis (ABA), combined with social skills groups and cognitive behavior therapy, to promote psychological, behavioral, educational, vocational, and social development. Patients receive treatment in both one-on-one and group formats. In the individual format, patients participate in therapy that focuses on vocational skills, functional academics, and adaptive skills. In the group format, patients participate in therapy that focuses on social skills, executive functioning, pragmatic language and emotional modulation. Patients receive cognitive behavioral therapy, both individually and in a group. During the summer months, teens who attend this program may transition to a vocational placement, in order to practice the vocational skills that they have been learning throughout the year in the STEPS program. The Knapp Center has secured multiple partnerships with employment sites for our patients to attend and practice job skills. Sites include gardens, animal shelters, farms and more. Throughout the course of treatment, behavior plans are implemented to reduce problematic behaviors. In addition, regular consultation and/or training occurs with parents to promote transfer of skills in order to achieve optimal treatment success. Staff receive regular supervision and reliability assessments to promote optimal treatment gains. The goal of the STEPS program is to provide intensive behavioral, psychological, and developmental remediation to prevent the need for long-term care and allow for successful transition of the patient to an outpatient level of care. The program goal is to identify behaviors that interfere with the child’s ability to function successfully within a typical classroom, provide empirically-based intervention to increase positive age-appropriate skills/behaviors, while reducing problematic behaviors so that they can participate in a least-restrictive environment. This oftentimes results in the child transitioning from the STEPS program, once meeting treatment goals, to a mainstream classroom within a local public or private school either with or without support of a BCBA and RBT. 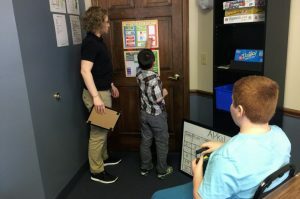 The STEPS Program at the Knapp Center for Childhood Development is a treatment program for youth ages 8-18 who have been identified with autism spectrum disorder, often combined with co-existing anxiety, depression, ADHD and/or learning disabilities. The patients in this program have not been successful in private or public education, may have been on the verge of expulsion, and require more intensive treatment in a safe therapeutic environment. Treatment is targeted to reduce skill deficits and/or problem behaviors that may include aggressive behaviors, self-injury, non-compliance, and other maladaptive behaviors. Each child in the program is served 1:1 by a Registered Behavior Technician (RBT). Educational background of RBTs include bachelor’s degrees in psychology, education, or a related field. The program has a licensed teacher for grades 7-12 in the program, who is also a RBT. Each child in the program is also assigned a Board Certified Behavior Analyst (BCBA) who supervises the RBT and directs the treatment of the child. BCBAs provide direct care and supervision weekly to each child 1-2 times per week. There is a License Professional Counselor (LPC) and BCBA, who leads social skills groups, cognitive behavioral therapy groups, and provides supervision to some of the RBTs within this program. Finally, there is a program Coordinator (a BCBA), who is on-site daily, a chief clinical coordinator (a BCBA) and executive director of the Knapp Center (pediatric neuropsychologist, BCBA) who provides oversight of the program. 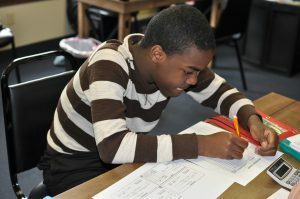 The STEPS Program also offers a STEPS After-School Program, which allows those who have transitioned out of the full-day STEPS program, or those who attend a public or private school, to access cognitive behavioral therapy and the social skills curriculum that our children who attend full-day, participate in. This program occurs from 3:00-5:00, varying in intensity from 2-5 days per week, depending upon the child’s needs and treatment objectives. In addition to CBT and social skills training, emphasis may also be placed on improving academic, adaptive and vocational skills, to promote independence and success within a least-restrictive setting. All children who participate in this program are between the ages of 8-18 years of age, who are diagnosed with autism spectrum disorder that may be combined with co-existing anxiety, depression, ADHD and/or learning disabilities. Each child in the program is served 1:1 by an RBT, who is supervised by a Board Certified Behavior Analyst (BCBA). All cognitive behavioral therapy is implemented by an LPC/BCBA; supervised by a licensed psychologist. Additionally, the STEPS After-school Program includes all oversight bodies of the full-day STEPS Program including the chief clinical coordinator and pediatric neuropsychologist.